To resolve this issue, download and install the Root and Intermediate Certificate Authority (CA) Certificate. If the correct Root and Intermediate CA have been imported and the error continues, more than likely the issue is due to a certificate request mis-match. 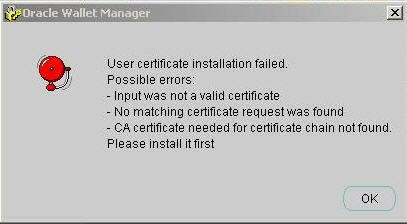 In order to resolve this, the correct certificate request must be located to install the corresponding certificate. NOTE: If this is not possible, a new Wallet should be created along with a new Certificate Signing Request. Oracle Wallet Manager 10.x.x.x does not support SSL certificates signed with a SHA2 Signature Algorithm. In order to support SHA2 certificates, you will need to upgrade to Oracle Wallet Manager 11.2.0.1.